Although many people now use their microwaves to heat up water, kettles are perfect for heating up larger amounts of water with ease. Whether you want your kettle to match your decor -- or you just can't find any kettles in fun colors -- you can easily paint your kettle with spray paint. But there is something to consider before you get started: if you intend to use your kettle, you'll have to purchase a spray paint that can be used on objects that are subjected to heat. This is to prevent hazardous fumes and to keep the paint from melting. Luckily, you can find these spray paints at your local home improvement store. Turn any plain or boring kettle into a colorful one with some spray paint. Pour two drops of mild dish detergent onto a clean cloth or sponge. Add a little water to the cloth or sponge, and work the soap into a lather. Clean the entire kettle with the dish detergent. The kettle must be properly washed in order to be painted: If the kettle is dirty, the paint will not adhere well. Tape any part of the kettle that you do not want to be painted, with blue painter's tape. If possible, unscrew the handle and lid knob. This will make painting the kettle easier. Set a tarp or garbage bag down on the floor to protect it from the paint. Work in a well-ventilated area like the garage with the door open, outside or in a room with plenty of open windows. Purchase a primer spray paint intended for objects subjected to heat -- like appliance spray paint -- if you're planning on using your kettle. Shake the primer spray paint well before spraying. Spray one even coat of primer on the entire outside surface of the kettle. Working from the top of the kettle, in a circle to the bottom. 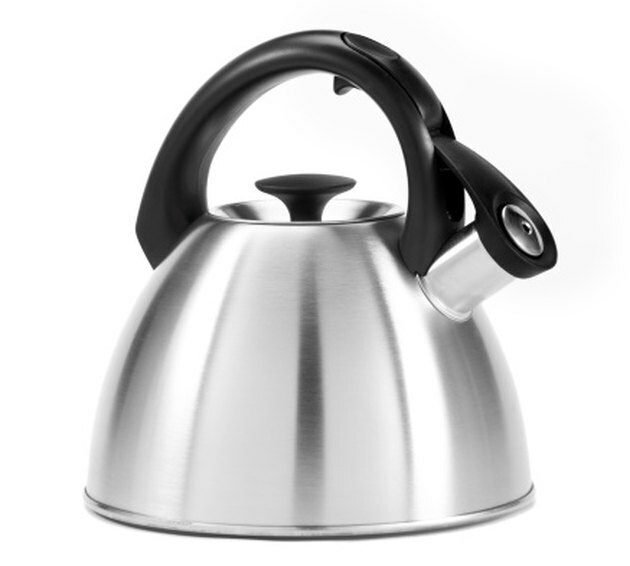 For kettles that are already dark colors, you may need a second coat, once the first coat has dried. Shake the can well, to ensure the paint is well-mixed. Spray an even coat of paint over the entire kettle, working from the top of the kettle to the bottom. Allow 2 to 4 hours for the paint to dry in-between each coat. Apply a second coat, or more, if the first coat appears streaky. Allow the kettle a full 24 hours to dry completely, before using it. If the kettle is just a decoration piece, you will only need wait 4 hours to display it.